There are many reasons to visit Myrtle Beach, and the best reason – in the minds of many visitors and even more locals – is apparent in its honorary title. Around here, they proudly call Myrtle Beach the Golf Capital of the World. On just one 60-mile stretch along the Atlantic, there are more than 120 golf courses, including a cluster on the Top 100 lists of national golf magazines. And families are particularly welcomed at Myrtle Beach golf courses too. More than 50 courses in the area allow children to play free when you pay the adult green fee. But where do you start? 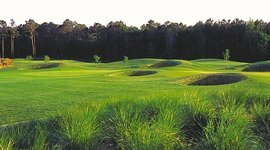 How do you choose a Myrtle Beach golf course that has what you’re looking for when there are so many options? I’ve put together three different “sampler packs” of golf experiences that show off the wealth and breadth of possibilities. First we’ll go through our tip-top tour of premier courses, then we’ll sample mid-ranged top-end courses, and finish off with some thrifty, but high-quality tracks. You’ll pay more on this “tour,” but you’ll get ample bang for the buck. 1. Caledonia Golf and Fish Club – Caledonia was crafted by the esteemed architect Mike Strantz in 1994 on the compact grounds of an old plantation-in-the-dunes on Pawleys Island. Strantz left intact the feel of the Old Coastal South, which means threading the original oak trees, draped with Spanish moss, into the fabric of the golf course. Ranked No. 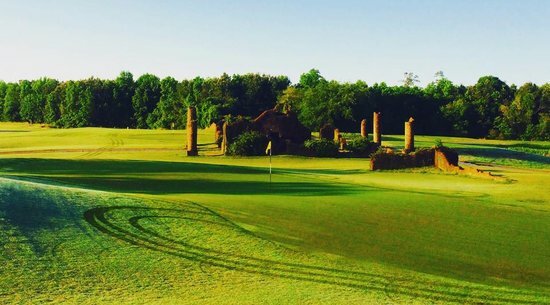 73 on Golf Digest’s most recent “100 Best Public Courses” list, this Myrtle Beach golf course also ranks right at the top among local golfers for its lush beauty and tough-but-fair playability. The old trees have matured even more over the last 20 years, which has narrowed the through lanes of the fairways, and the greens are protected “by some pretty nasty bunkers,” Guertin says. You’re not off the hook once you reach the greens, twisty and shelved as they are. With all that, this par-70 layout is a true resort course, in the sense that golf balls are relatively easy to find under the high canopies of the old oak trees. 2. The Dunes Golf and Beach Club – This is most decorated of Myrtle Beach golf courses (No. 50 on the Golf Digest public 100) and has played host to six Senior PGA Tour Championships, a US Women’s Open, and numerous PGA Tour qualifying-school events. 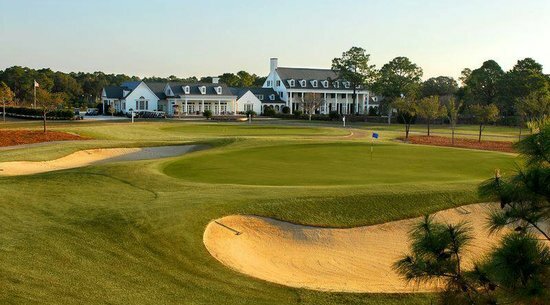 The Dunes is a semi-private golf club in Myrtle Beach, but you can get in by calling (855) 409-2177. Press 2 on your phone to speak with one of their golf directors who will set you up with a tee time (you won’t be able to schedule one directly through The Dunes). Completed in 1949, the Dunes is an early-career gem by the legendary Robert Trent Jones. 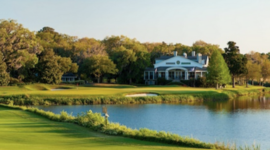 In 2013, Rees Jones, his son, completed a renovation that returned The Dunes very closely to the golf course crafted by Robert Trent Jones more than 60 years before. “He did a very nice job of staying true to his father’s vision,” says King. The Dunes annually tops the list of the Grand Strand’s most difficult courses, and it’s well-earned: it now plays to 7,450 yards from the tips, with a course rating of 76.1 and a slope rating of 148. Its signature hole, No. 13, known as The Waterloo, brings Lake Singleton into play. 3. The Dye Course at Barefoot Resort and Golf – The highest-rated of the four golf courses at Barefoot Resort, the Pete Dye design is tough, playing to 7,343 yards from the tips. 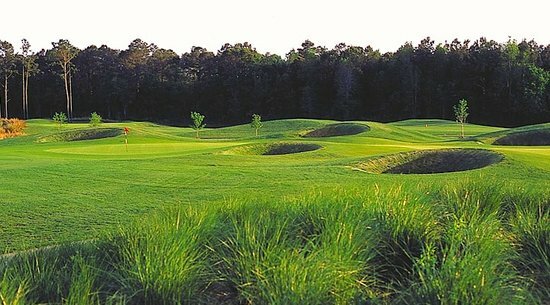 But pick the right tees and average players can enjoy the beauty of this North Myrtle Beach course without undue suffering. The Dye Course ranked in the Top 100 public courses by Golf Digest as recently as 2009. It rests alongside layouts by three other top designers at Barefoot – Tom Fazio, Davis Love III, and Greg Norman. A little of the lower end, a taste of the expansive middle ground, and a high-end gem distinguish this Grand Strand sampling. It’s also supremely playable, with broad fairways and shortish par-5’s contributing to its popularity for family play. From the back tees, low handicappers get a more-than-decent shot at this North Myrtle Beach golf course. Additionally, Hugh Royer Golf Academy at Possum Trot ranks among the best golf teaching facilities in Myrtle Beach. 5. Pine Lakes Country Club – Deep history, Southern charm, and a steep modern-day challenge distinguish Myrtle Beach’s first golf course, which opened in 1927. It’s affordability today lets it fit nicely in the middle slot of this sampling. The course nicknamed, “The Granddaddy” was designed on sandy ground, a few hundred yards from the ocean, by Robert White, a transplanted Scotsman who was the first president of the PGA of America. A renovation in 2007-08 rerouted the back nine, installed brand new holes on 17 and 18, and restored the course to its classic character. The grand colonial clubhouse remained the same. “It’s a special piece of property,” says head PGA professional Matt Daly. Pine Lakes plays today to 6,675 yards, with a course rating of 134. “The greens aren’t big, so good players have to hit greens to make their number,” Daly says. About the history: Pine Lakes is the birthplace of Sports Illustrated. In 1954, executives of Time-Life gathered at Pine Lakes and, “over a few cold ones,” hashed out the concept for a weekly sports news magazine. 6. True Blue Golf Plantation – The sister course to Caledonia on Pawley’s Island commands a high enough fee to place it on the upper end in the region, but if you pony up, you’ll be rewarded with a distinctive Myrtle Beach golf experience. True Blue was built from a Strantz design on the grounds of a former rice and indigo plantation. Gnarled oaks and Carolina pines lend a Southern country feel alongside tidal creeks and salt marshes. In recent years, True Blue has graced the Top 100 public list of Golf Digest and is routinely ranked among the top handful in Myrtle Beach. These courses will test your talent and temperament, but won’t wax your wallet. 7. 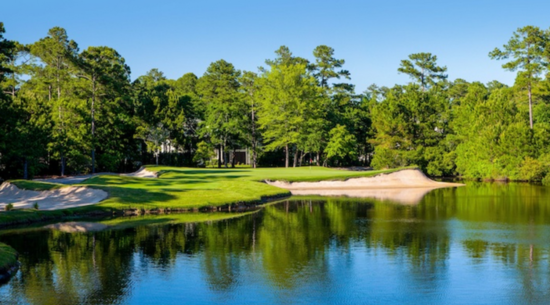 Blackmoor Golf Club – When you play Blackmoor, the only Gary Player design in the Grand Strand, you’ll come away talking about No. 8, a par-4 that gives you two distinct options to attack the hole. Taking it down the left of the split fairway is a little longer, but the safer play. Down the right, it’s a classic risk-reward at 290 yards to the green. In the past, the rough short of the green swallowed golf balls. Now, a more shaved front means you should be able to find your ball, says Blackmoor’s head PGA professional, Paul Fastenau. 8. Eagle Nest Golf Club – You could play your best golf through 15 holes on this Little River layout, but don’t expect to cruise to the finish. The closing holes at Eagle Nest are widely considered the toughest trio on the Grand Strand. 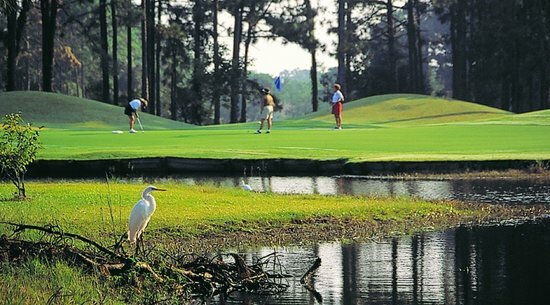 A serious golf challenge, and seriously reasonable fees, makes Eagle Nest one of the most-played courses in the Myrtle Beach region. The centerpiece of the final three holes is the 576-yard No. 17, with water hazards and bunkers carefully guarding the green. 9. 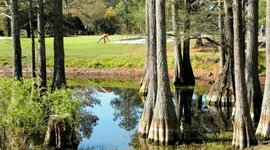 Wicked Stick Golf Links – True to the vibe of John Daly, golf’s man of the people, this course is among the most affordable in the Grand Strand. Daly designed the course with long bombers in mind, so take aim and fire away: the course has broad landing areas blessedly free of fairway bunkers. That is not to say it lacks a challenge. From the back tees, where Big John hits ‘em, the course stretches past 7,000 yards. Two other tees at about 6,000 and 6,500 yards make the course accessible to shorter hitters. 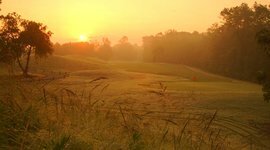 The golf industry in Myrtle Beach is motivated to help you play golf on its courses and find a place to lay your head at the end of a long day on the links. Search online for the name of any Grand Strand golf course, and you’ll find links and numbers for booking a tee time. 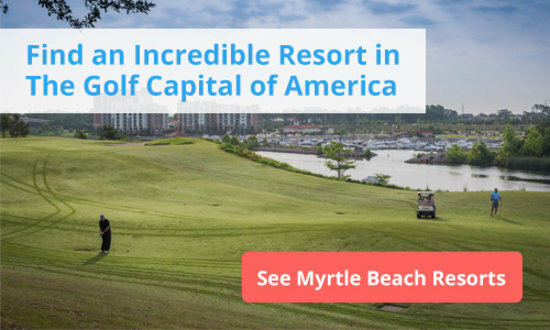 One handy place to start is Myrtle Beach Golf. Search by name, course ratings, high-to-low green fees (or low-to-high) for any course in the region. Golf in Myrtle Beach: Quantity, quality, and customer service. 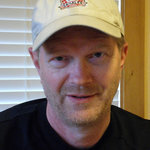 Those who call the Grand Strand the Golf Capital of the World will find few dissenters. Designed with long bombers in mind, the course has broad landing areas free of bunkers. So take aim and fire away! Don't be deceived by the first 15 holes, the last three'll getcha. No. 17 is a monster at 576 yards with water hazards and bunkers guarding the green. Eerie oak trees draped in Spanish moss give it a 'Gone with the Wind' feel. Lush beauty and tough-but-fair playability make it one of the 100 best public courses. With its famous risk-reward No. 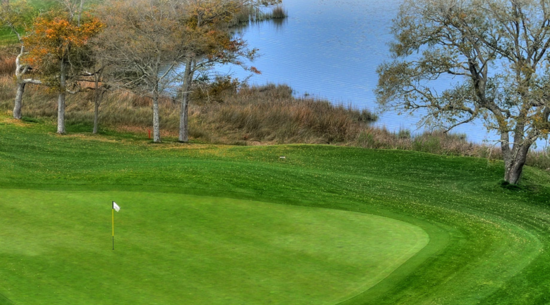 8, this Murrells Inlet Golf Course is also ranked among the "Top 100 Women-Friendly Courses." 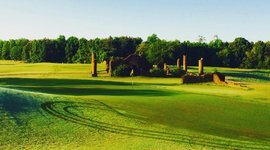 Built on an old indigo plantation, next to its sister Caledonia, it's routinely ranked by Golf Digest as one of the best Myrtle Beach Golf Courses for its supreme beauty and playability. 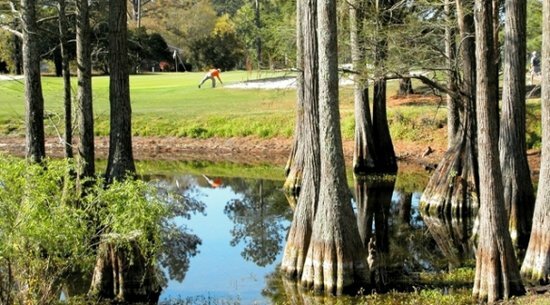 The "Friendliest Course on the Grand Strand," Possum Trot features broad fairways and shortish par-5s. It's great for family play and has a top-ranked golf academy. Ranked in the top 50 public courses, it's one of the Grand Strand's most difficult courses, playing to 7,450 yards with a course rating of 76.1 and slope rating of 148. Known as "The Granddaddy," this course was designed by the first president of the PGA. In 1954, executives of Time-Life gathered here to hash out the concept for Sports Illustrated.